Google Scholar – who is referencing us? 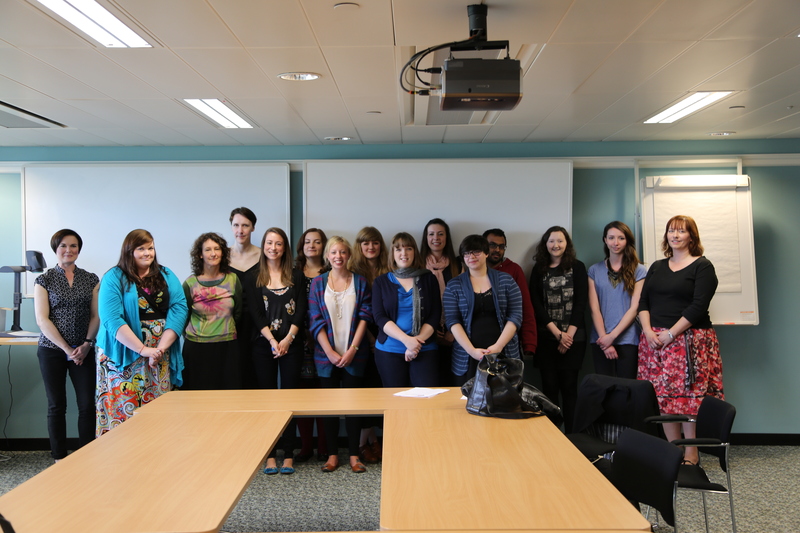 This is a guest blog post from Laura Keizer, one of our volunteers working in the Centre for Research Collections. Archives are delightful places. Working in such a place regularly puts you in touch with a motley crew of visiting researchers who merrily toil away to complete diverse portfolios of original research. We help out where we can, provide documents, answer queries, and generally solve all sorts of interesting little mysteries. But despite our best efforts, we don’t often get to see where their local research takes the visitors afterwards, making the precise impact of the archive sometimes difficult to gauge. This entry was posted in Collections, Library, Volunteers on December 11, 2014 by universitycollectionsvolunteers. 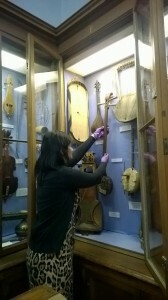 I have been working with the Musical Instrument Collection since October and I had the chance as a volunteer to explore different areas of their two museums, St Cecilia’s Hall and the Reid Concert Hall. During the first 3 months, I was a guide at St Cecilia’s Hall, which was great as it permitted me to familiarise myself with the collection. During my Bachelor’s Degree and first Master’s Degree, I specialised in museology but never came across musicology which means that I was a complete beginner when I first started. Needless to say that I learnt a lot! 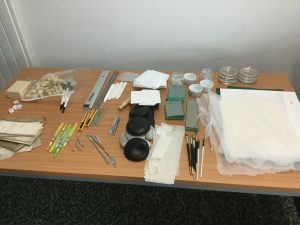 Since last month, I have been working in collaboration with Colette Bush, the Museums Galleries Scotland Intern based with the CRC and Museums, at the Reid Concert Hall, where we are in charge of reviewing the display of the collection. I am very excited about this project, even more so when I learnt that the Reid is actually the first purpose built establishment as an instrument museum in the world. This project is connected to the redevelopment plan at St Cecilia’s Hall which will lead to its temporary closure next September for about a year or two. 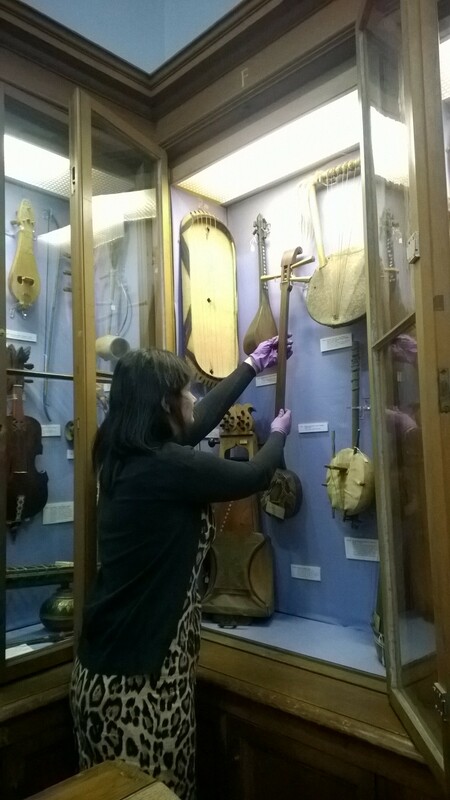 Until now, the musical instrument collection was equally spread out between both museums. During St Cecilia’s Hall’s closure, the collection will be only visible at the Reid which means the museum will become the collection’s main venue. One other aim of this project is to expand the museum’s engagement with the general public by making the content more accessible. In order to do that, we are planning a display based on thematics but we also intend to make the content of the cases more comprehensible by putting more explanatory labels and less instruments on display. Even if the Reid itself is quite small, the collection on display is actually quite extensive which can be quite disconcerting for the visitor (around 1000 items are on display!). Although, the collection being first of all a teaching collection, it should still be complete enough so the music school can use the collection as a point of reference for their classes, which is a big challenge as we need to find the right balance between accessibility and educational purposes. This entry was posted in Collections, St Cecilia's Hall, Volunteers on March 3, 2014 by universitycollectionsvolunteers. 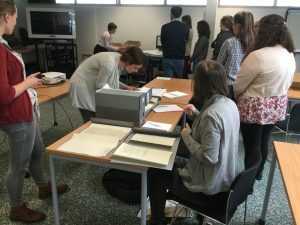 Since October, I have been volunteering with the CRC, doing one or two day sessions with each department and discovering how every job contributes to the task of running the University of Edinburgh’s Special Collections. 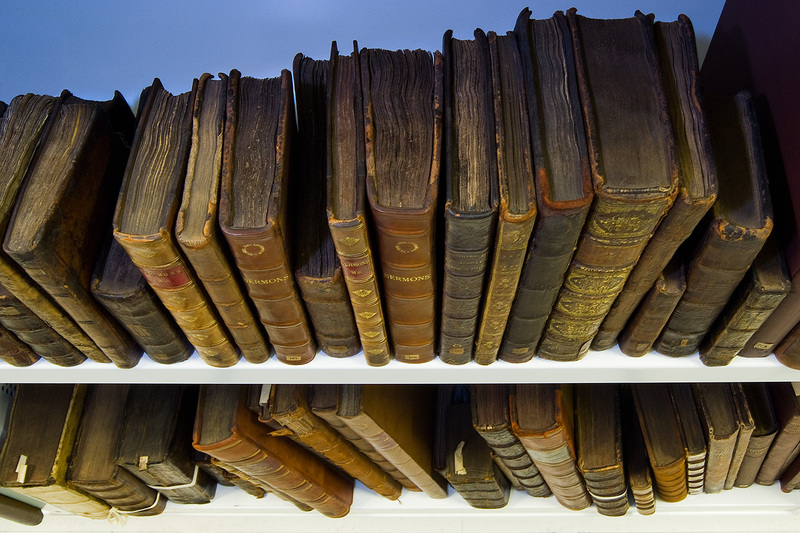 Just by volunteering one day a week, I was able to jump right into assisting with book collections, responding to queries for information or digital images, and the beginnings of rare books and archive cataloguing. Among other highlights, I discovered a fascinating drawing in a late 19th century casebook from the Lothian Health Services Archive, encountered more books in Icelandic than I’d ever imagined would be in Edinburgh, and spent a rather poignant day sorting materials associated with alumni who fought in WWI. 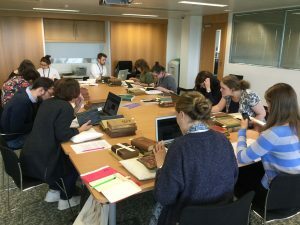 As a student in the MSc Material Cultures and History of the Book programme, the experience has proved invaluable in my understanding of how the modern library handles rare books, manuscripts, and archives, and the varied professions associated with an institution such as the CRC. This practical information has dove-tailed nicely with my academic interest in book history, and rounded out my studies in a way that simply completing my course-work never would. When I started volunteering, I knew I wanted to work in a library but wasn’t sure where I would be the best fit, but by learning about every department, I was able to determine that my strongest interest is in rare books, which led directly into my new position as one of two cataloguing interns in the rare books and manuscripts division of the CRC, which I am eagerly looking forward to as the next step on my career path. 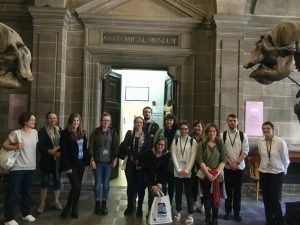 I would strongly suggest that anyone with an interest in literature, art, history, or, obviously, book history, take the time to volunteer at the CRC, because it’s a rewarding way to see how your academic interests can be applied to managing and preserving the wealth of material culture available at the University. This entry was posted in Collections, Library, Volunteers on February 4, 2014 by universitycollectionsvolunteers. Once a fortnight for the past two years I have been conserving 550 sheets of paper belonging to the Carmichael Watson Collection. These date from the late 1800s to the early 1900s and are all mostly in Gaelic, written by the scholar Alexander Carmichael. Most of the sheets needed quite a lot of attention. The majority of them needed surface cleaning. This entailed using a chemical sponge and gentle use of an eraser. There were also sheets which had rust on them where metal paper clips had been attached. Rust was removed with the tip of a scalpel using magnifying glasses. Great care was needed so that only the damaged fibres were taken away. Tears were repaired using Japanese paper and wheat starch paste with the pages pressed to ensure the ‘glue’ had dried. Finally all the sheets were placed in acid-free folders and housed in a low-acid board box. Some of the sheets had interesting watermarks on them and as an aside from the practical element of this paper conservation I decided to do a bit of investigation in my own time. Some of the watermarks originated from a papermaker in Glasgow. I found out that the United Wire factory which I live near created the wireworks used for making paper, so it is possible that some of the paper on which I had been working might have been created on wires made in this factory. This entry was posted in Carmichael Watson Project, Collections, Conservation, Volunteers on August 28, 2013 by universitycollectionsvolunteers. I have been working on the Quatercentenary Collection for more than 6 months. In 1983 the University celebrated its 400th anniversary and, as part of these celebrations, the University library put out a call to all alumni and ex-staff (this was before the archive existed), asking them for contributions to a collection which would be used to illustrate student life at Edinburgh. Hundreds of people responded, and the library was sent thousands of items including class cards, degree scrolls, lecture notes, tickets to dances, menus for club dinners and photographs. It’s not just documents, though – I have found two embroidered velvet caps and a box of 1930s cigarettes! I think my favourite thing in the whole collection is a dance card from the 1920s, which has a tiny pencil attached by a piece of ribbon. 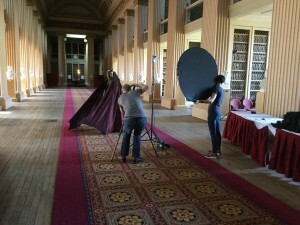 The collection ranges in date from the 1870s to the 1970s – more or less 100 years of student life at the University of Edinburgh. Many people who sent items also included letters with their recollections of their time at university. This enormous, important collection was then split up according to type: photographs in a box with other photographs, boxes full of party invitations, boxes and boxes containing only class cards. My job is to put each individual accession back together again – instead of items being catalogued by type, they will be catalogued in groups according to who deposited them. This has meant making a list of what is in every one of the 42 boxes, and then going through every box and taking out the separate items and rehousing them in proper archive folders and boxes. It is very satisfying bringing all the different items together to make a little picture of an individual’s time at the University of Edinburgh. I love knowing that these things will be catalogued in their proper place, and that one day someone will look at them and find out about an ancestor’s student days. 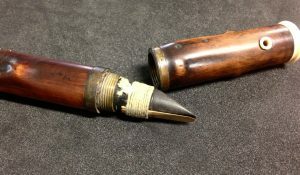 This entry was posted in Collections, Volunteers on June 27, 2013 by universitycollectionsvolunteers. 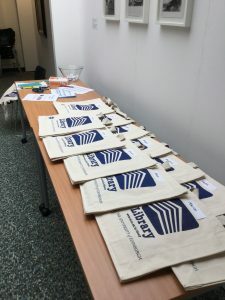 Some of our volunteers gave presentations at a special event yesterday to say thank you to our volunteers for the all hard work that they have been putting in over the past few months. 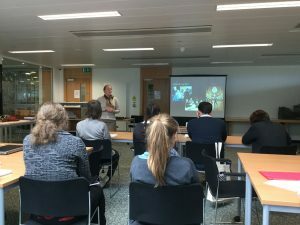 Eleven volunteers gave short presentations outlining the work they have been doing, what skills they have been learning and how their experiences have been helping them to develop. 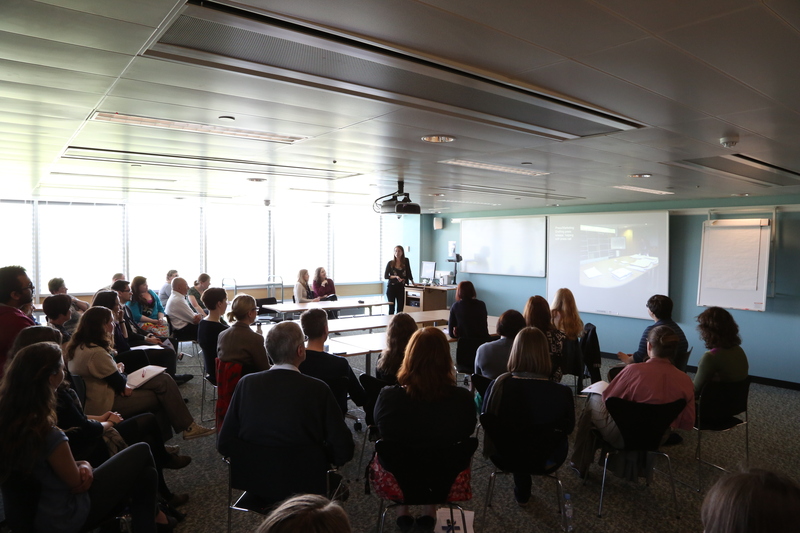 We would like to say a big thank you to everyone who attended yesterday’s event in the CRC and especially to those who did presentations. This entry was posted in Collections, Interns, Volunteers on June 6, 2013 by universitycollectionsvolunteers.